High Speed 2 (HS2) is a planned high speed railway which is aimed to be the new backbone of the national rail network, linking London, Birmingham, the East Midlands, Leeds and Manchester. 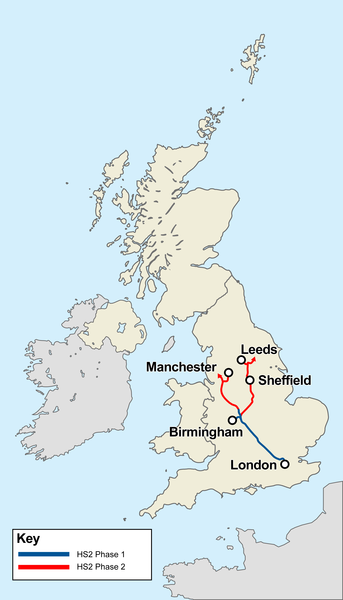 The line is to be built in a “Y” configuration, with London on the bottom of the “Y”, Birmingham at the centre, Leeds at the top right and Manchester at the top left. The project is to be built in two phases. Phase 1 is from London to the West Midlands and Phase 2 from the West Midlands to Leeds and Manchester. Phase 2 is split into two sub-phases, Phase 2a and Phase 2b. Phase 2a is from the West Midlands to Crewe. Phase 2b will extend the project from Crewe to Manchester and the West Midlands to Leeds. The line of this high speed railway will pass approximately 1400 metres to the south-west of the nearest house in Sulgrave Village. See here for an Interactive Map of the Route. To provide the latest information on the progress of the planning and implementation of the construction works in the vicinity of Sulgrave. To provide a simplified explanation of the extent and form of these works and the implications for the village and its inhabitants. Report from Daily Telegraph: Ministers have delayed signing off on the first half of spending for High Speed 2 over concerns about the project’s spiralling costs, The Telegraph can disclose. Note: This delay does not apply to enabling works such as the improvements to the junction between the B4525 and Sulgrave Road, Greatworth currently being undertaken. News Update: Funding awarded to improve Marston St Lawrence Village Hall. Grant Aid from HS2 Community and Environment Fund approved for Church Hall Improvements. Preliminary works are taking place near to the village, such as drilling for soil and subsoil samples, the establishment of compounds and setting out. It is anticipated that the contractors will commence the actual construction work in the Sulgrave area, comprising the Greatworth green tunnel and associated road bridges, in the second half of 2019. However, it seems that there is still much work to be done to finalize the design, programme and construction methodology. The improvement work to the Greatworth junction with the B4525 should start in the new year, commencing with a compound set up and then progressing to the new junction layout. Misleadingly for Sulgrave inhabitants, both HS2 and the contractors continue to call this the “Sulgrave Junction”, presumably because the road between Greatworth and the B4525 is known as “Sulgrave Road”. This work should be completed by spring 2019. Just to reiterate that no improvement works are proposed for the Magpie junction. 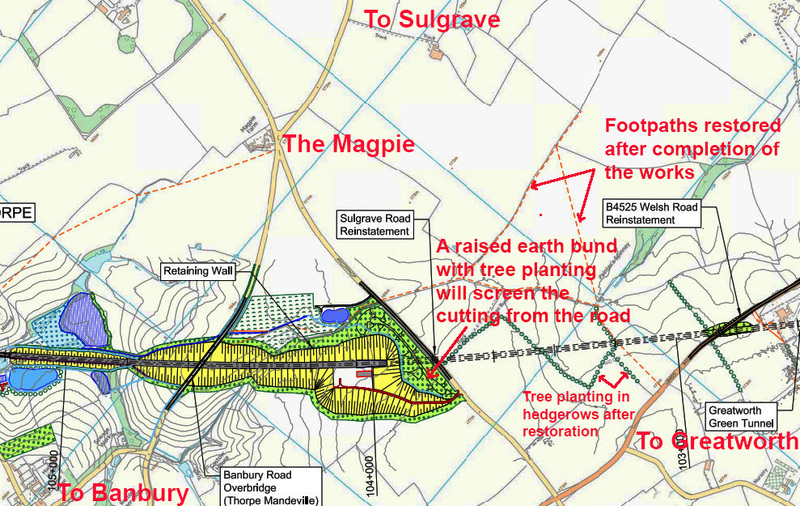 The main impact of the construction work on footpaths in Sulgrave Parish involves footpath AY12, which commences just over half a kilometre south of the Magpie on the road to Marston St Lawrence. For almost 300 metres this footpath heads south east along the line of the hedgerow which encloses what might be called the large Magpie field. It then joins the footpath along the double hedgerow leading due east to the Stuchbury cottages. Footpath AY12 is right on the edge of the land to be taken for construction. Its fate is currently undecided and will be in the hands of the contractors. It may be that they can complete the work without disturbing it or they may apply for a closing order. Hopefully it will remain open at least until the middle of next year and possibly permanently. HS2 Community Engagement Meeting in the Church Hall on Thursday 27th September, 7 to 9 pm. HS2 and Eiffage Kier have committed to present their strategy for the works schedule and logistics impacting Sulgrave and the surrounding locale of HS2 on the 27 September 2018 at 7pm. The meeting, which will take place in Sulgrave village hall, will comprise a presentation by them, followed by an open forum Q&A session. All are invited to attend. In the interests of keeping the meeting as objective and efficient as possible, and also to address all concerns, please post questions in written form to the Sulgrave village shop or through my letter box or via email to anna.faure@hotmail.com in advance so that I can prep the speakers. We can take questions from the floor on the night as well otherwise, but these will be lower priority if time is a factor. I will assume that if you have a question, you intend to attend (if not, let me know). If you don’t have a question, but intend to attend, please let me know. JULY 2018. The start date for High Speed 2 civils works has been delayed until June 2019, the Department for Transport (DfT) has confirmed. The notice to proceed (NTP) has been pushed back a further three months. Parliamentary under secretary of state for transport Baroness Sugg confirmed the delay, stating “Following consideration of supplier feedback, the HS2 Ltd Board has recently decided to move the date of Notice to Proceed from 1 March 2019 to 1 June 2019 in order to provide suppliers with additional time to optimise their designs. Contracts have been let in respect of that section of the line which affects Sulgrave. With the demise of Carillion, the contractors are Eiffage and Kier. The contracts will be let in two stages. Stage One is a 16 month period to develop a design, a programme and a target cost for the construction of the works. Stage Two is for the construction of the main works and this is expected to take between four and five years to complete. Scheme design is expected to be completed by December 2018, followed by a period of review and assurance, with the main civil engineering works anticipated to start in the Sulgrave area around Spring 2019 (subject to finalising the contractor’s programme of activities). The general civil engineering work is expected to be completed by 2023 followed by a two year period for the installation of the railway systems, signalling and overhead lines. Following a year of systems testing, the line is expected to be in use by 2026 or 2027. There will be a number of preparatory schemes in advance of the main construction work, notably the improvement of the Greatworth Junction with B4525, as shown below. Villagers will remember the fatal accident involving a much loved Sulgrave resident a few years ago and the early improvement of this junction must be welcomed. Design work on this is in progress and the work is expected to take place in Autumn of this year. Sulgrave evidently qualifies as a village which will be “demonstrably disrupted” by the construction works and which could certainly find a use for funds to the benefit of the community. With this in mind, an application for funds to improve the Church Hall is being made by Ingram Lloyd on behalf of the Parochial Church Council (the building being in Church ownership) and Councillor Anna Faure on behalf of the Parish Council, whose latest report on progress can be seen here. A village meeting to discuss this matter was held in the Church Hall on Thursday 12th April. See here for details. The engineering drawings for the project are necessarily complex and do not show the relationship of the construction site to Sulgrave village. The map below has therefore been prepared so as to indicate on an Ordnance Survey base, which also shows the village, the approximate area of land potentially required during construction. 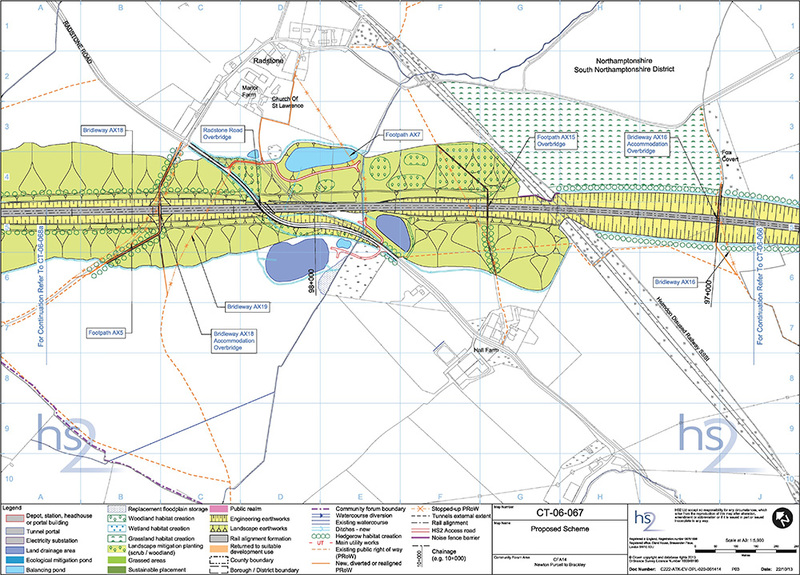 This is not an HS2 document but has been prepared with reference to HS2 drawings CT-05-070 and CT-05-071. The works will be undertaken in such a way that the B4525 and the roads between the Magpie and Thorpe Mandeville (route to Banbury) and between the Magpie and Greatworth/Marston St Lawrence, will be kept open at all times. This will be achieved by the construction of road diversions as shown diagrammatically in blue dots on the map below. The Helmdon Road connection between Greatworth and the B4525 will be temporarily closed between points C and D on the map for approximately one and a half years during the construction period. It will then be re-opened on a new alignment 50 metres north of the current alignment. The Thorpe Mandeville to Culworth Road will be closed at Point E for between one and two months during the construction of the viaduct and then re-opened on its present alignment..
To the south-east of Point A on the above map the railway line will be constructed as a cutting at the foot of which will be a prefabricated tunnel. This will then be covered to form what is to be known as the “Greatworth Green Tunnel”.To the north west of Point A, the line will be in an open cutting between the Sulgrave Road and the Banbury Road and then on an embankment and viaduct crossing the valley at Lower Thorpe. Representation of the method of constructing the tunnel at the foot of the cutting. Excavated material will be stored predominantly on the NE side of the cutting and within the boundaries of land shown on the map below, where it will form a temporary “bund” which may be helpful in mitigating the noise of construction. On the completion of the tunnel, this material will be backfilled and consolidated to the same level as the surrounding land. Topsoil will be stored separately and will form the final layer in returning the area to agriculture, together with new landscaping and tree planting. This is shown diagrammatically on the map below, where the area to be restored to agriculture is shown in green and the area of the open cutting and viaduct is shown in blue. See here for a bigger version of this map. Construct temporary diversionary roads to Local Highway Authority standards, at existing ground level to bypass the construction works. Divert traffic onto temporary diversions (this will be maintained until the new roads are complete).Excavation under the existing roads to railway line level. Construction of short sections of tunnel/cutting under existing roads. Construction of the new overbridges and new roads on or near the existing alignments. Open new roads and remove temporary road diversions. Construction of the remainder of the “Greatworth Green Tunnel” and restoration to agriculture. Regular travellers to Brackley via Helmdon should note that just south of the Radstone turn, there will be a bridge over the new railway line, some 50 metres west of the present road alignment (Point “X” on the map below). The present road will remain open until this bridge is completed but the road between Point “X” and the B4525 will be a designated construction road for the duration of the works, shown in blue dots on the map. See here for details of the Radstone crossing. Footpaths shown in blue dots will be stopped up for the duration of the works and re-opened upon completion. Other footpaths shown in small green dashes will remain open throughout. The footpath between Points A and B on the above map is one of the most attractive in the village, following the top of a broad ridge with panoramic views of the village. It also follows a “double hedge” which is described in the Village Website Parish Appraisal as being “….at least 500 years old by Hooper’s Rule….including species which offer a virtual larder of fruits, nuts and berries for both birds and animals alike….” Those who have not enjoyed a walk in this currently tranquil area are advised to do so during the next few months….. 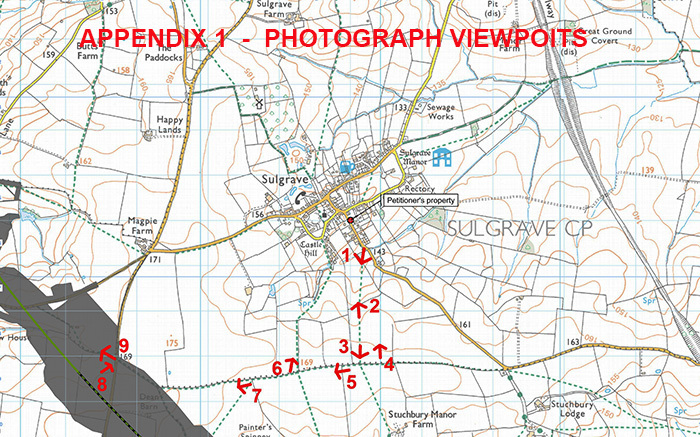 Appendix 1 – Map showing the photograph viewpoints. Appendix 2 – The photographs. Despite re-assurances that construction traffic will not be allowed through Sulgrave, it is inevitable that there will be an increase in general traffic flows during the construction period. Whilst this will be unwelcome, there may be some compensation in the probability of additional customers for the Community Shop, The Star and the providers of overnight accommodation. This compound will be used for civil engineering works only, adjacent to Lower Thorpe. The compound will be operational for approximately two years, start date to be advised. It will support approximately 110 workers each day throughout much of this period; increasing to a maximum of approximately 190 workers each day during the peak period of activity. It will not provide worker accommodation. It will be accessed via Banbury Lane (the road from Thorpe Mandeville to Culworth via Lower Thorpe) from the M40, A422 and B4525 and/or the M40, A43 and B4525 from the west. Demolitions will be required at two properties: residential property (Twin Oaks and two associated outbuildings) at Banbury Lane and residential property (Lower Thorpe Farmhouse (Grade II listed) and two associated outbuildings) at Banbury Lane. Diversions of two roads will be required: temporary closure of Banbury Lane with temporary alternative route via Banbury Road, for a period of approximately one to two months, then permanent reinstatement along its existing alignment and permanent reinstatement of Culworth Grounds private access, 80m to the south via the new Culworth Grounds accommodation overbridge. A temporary alternative route for Banbury Lane footpath will be required, to the north for a period of approximately one year and six months to two years, adding an additional 600m. It will then be permanently reinstated along its existing alignment. This compound will be used for civil engineering works only, adjacent to Thorpe Mandeville. The compound will be operational for approximately two years, starting time to be advised. It will support approximately 30 workers each day throughout much of this period; increasing to a maximum of approximately 45 workers each day during the peak period of activity. It will not provide worker accommodation. It will be accessed via Banbury Road from the M40, A422 and B4525 from the west. It will have an associated roadhead with access to/from Banbury Road for the receipt, storage and transfer of earthworks material route-wide (see Map CT-05-071). This storage area is on the opposite side of the road to the compound and is shown shaded in blue on the above map. 3. Greatworth Green Tunnel (North Portal) Satellite Compound. This compound will manage railway systems installation works only, from approximately Greatworth to Thorpe Mandeville. The compound will be operational for approximately one year and six months, starting in 2022. It will support approximately 10 workers each day throughout this period. It will not provide worker accommodation. It will be accessed from the M40, A422 and B4525 from the west. 4. Greatworth Green Tunnel Satellite Compound. This compound will be used for civil engineering and railway installation works, between Greatworth and Thorpe Mandeville. The compound will be operational for approximately six years and six months, including civil engineering works for approximately four years and six months, commencing at a date to be advised and railway installation works for approximately two years and three months, starting in 2021. It will support approximately 145 workers each day throughout the civil engineering works period; increasing to a maximum of approximately 235 workers each day during the peak period of activity; and support approximately 20 workers each day throughout the rail systems installations works period increasing to a maximum of approximately 40 workers each day during the peak period of activity. It will not provide worker accommodation. It will be accessed via A43 and B4525 from the east and via the M40, A422 and B4525 from the west. Demolitions will be required at two properties: two buildings occupied by two motorsport engineering businesses: Triple Eight Race Engineering and MP Motor Sport Ltd, part of the former World War II wireless reception and intervention centre at Greatworth Park; and commercial property (one building and one outbuilding at Dean Barn) near Sulgrave Road. It is difficult to estimate the probable noise impact upon the village of the works in progress. The best that can be said at the moment is that working hours will be restricted to 08.00 to 18.00 on weekdays and 08.00 to 13.00 on Saturdays. Given the nature of the local geology, it seems unlikely that blasting will be necessary in the excavation of cuttings. Some pile driving activity may be necessary but this is less noisy that was once the case. The contractors will have appointed agricultural liaison officers (ALO) to liaise with local farmers and landowners as the work progresses. Much of the information in the above description of the proposed construction works is derived from the “London – West Midlands Environmental Statement, Volume 2 – Community Forum Area Report -Greatworth to Lower Boddington” Click here to access the report itself. Despite huge efforts by many people at both national and local level, the threat of the construction of a high speed railway within 1400 metres of the village has now become a reality. However, those efforts should not be forgotten and I therefore set out below links to relevant items which have appeared on this website during the seven years. Sulgrave Parish Council Petition to Parliament in 2016. Following on from the petition, HS2 were directed to assure the Parish Council that there would be continued consultation as the design work progresses and the contractors are therefore contractually obliged to honour this assurance. A transcript of the hearing of the Parish Council’s petition, presented by then Councillor David Walker, can be seen here. In the context of representations concerning HS2 made on behalf of Sulgrave, the dedication and hard work of former Parish Council Chairman Ken Christy should not be forgotten. Newer villagers may not be aware of his appearance before the Select Committee as a petitioner. See here for the very comprehensive case made in the petition. Government consultation. Full details of the scheme with maps and links to SNAG opposition group. How to make your views heard etc. Details of the extension to the consultation period with full details of impact on this area. Community update, what’s happening etc. Report on HS2 event held at Sulgrave Manor on October 17th. Note: All extracts from OS maps featured on this website page are published under licence from the Ordnance Survey. All rights reserved.